Lorna and Marty are two wonderful, selfless, sweet people with very big hearts. They, and Lorna’s husband Reinaldo, have been very good friends for quite some time. They all live in South Africa and Lorna and Marty do the same work together. There are several things that they do each day, and through what they do, they touch the lives of many, many people. Here is a general idea of the work they accomplish. First of all, Lorna and Marty volunteer to teach English at a school in Capetown. Every morning, at about 6:30, they head to the school to begin teaching. They have a different group of kids each day of the week. Secondly, they aid about thirty daycares in total. The daycare homes Lorna and Marty help with are regular homes in the poorer sections of Capetown. These homes are run by women who are trying to help young children who have been left alone during the day. The reason they have been left alone is because their parents needed to work and their older siblings needed to go to school. There are a few ways they serve here. One way is just by checking in on these daycares and helping in whatever ways they can. Recently, they gave each of these homes some plants which used a very cool technique to grow. One of their friends had designed this new method not long ago. All the women have to do is make sure that the plants are getting enough water and are in a good place for the sun to reach them. The rest comes like magic! Below is a picture of this unique system. 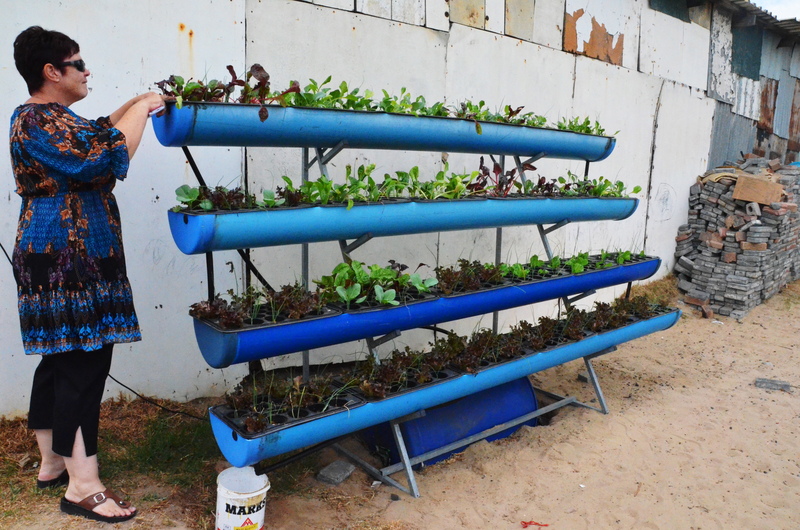 These little “gardens” are great because they can be used to feed the children or be sold to make a little extra cash. Another way Lorna and Marty help these daycares is by collecting supplies for them. They acquire as much as they can from donations and then distribute it to the different daycares. People send them practically anything and then they put it to use. All the supplies they are sent go to their storage room and are then organized, packed, and distributed to those whom they think need it. Now, all sorts of things are sent to them! Anything, really! Even if it has been used, or is random, or would be something you would have thrown away, for example: A tiny, fabric baby book was sent in. It was one of those cheap little books with a few words and 3D animals sticking off the pages. Nearly anyone would have thrown away such a silly little thing as that was. However, this little book would now be given to a small African child who could now call this his/her very first book. Yet another way in which Lorna and Marty volunteer their time is by helping this one large family who lives in a slum of South Africa. This couple – Julius and Irene – has taken in about 20 children who have all been abandoned in some way, shape, or form. Lorna and Marty help them by bringing over necessities (like soap, toilet paper, etc…), bringing games and crafts for the kids, and just being there for them. Through the lives of these two wonderful people, God has blessed many others. Through all the services Lorna and Marty have participated in, they have touched the lives of many. They have taught numerous kids how to speak English; they have assisted in enabling all the daycare children’s parents to be able to work without their kids; they have helped families in very poor situations; they have provided material needs; and most importantly, they have provided encouragement, support, and love. I prayed for Lorna and Marty and Julius Nd Irene this morning. Thank you for sharing all your travels with us, especially the work of so many of our brethren around the world. I am so glad to hear that! You are very welcome; it is my pleasure and a blessing to be able to do so.